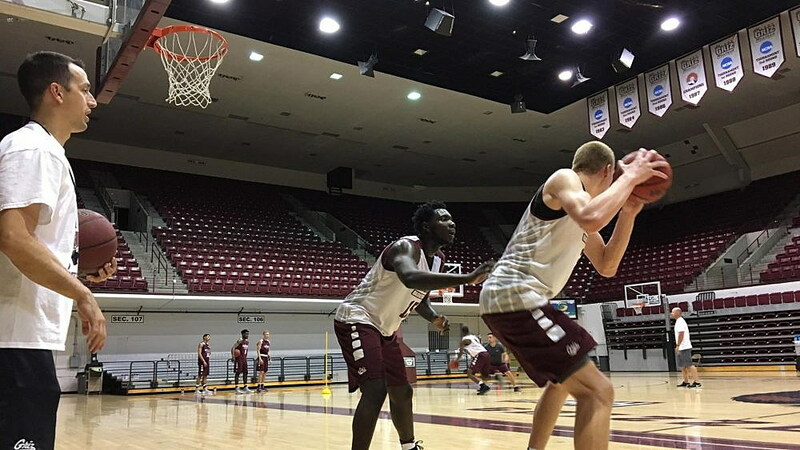 After the NCAA restructured its offseason regulations, allowing basketball coaches four hours per week with their teams compared to the traditional two, Montana head coach Travis DeCuire decided to get creative. Two hours per week, as you can imagine, is not much time. DeCuire and his staff tried to make the most of the summer workouts over three 40-minute sessions per week. While two was too little, four, DeCuire believes, is too much to focus specifically on skills development, at least at this time of the year. So this summer, Montana spent three hours developing skills and the fourth competing – but with a twist. So that final hour? It started out as an experiment, and has transformed into the most beneficial part of the team’s summer training. That’s because, instead of simply holding open gym and the coaches watching what’s happening on the floor, the coaches have been directly involved. Assistant coaches Chris Cobb, Jay Flores and Rachi Wortham each have led a team, playing with the student-athletes. DeCuire feels that observing open gyms are generally wasted time because each player is trying to do his own thing, but with a coach on each squad, it’s become less individualized and more about the team. DeCuire has also noticed an increase in communication when the coaches are on the floor. Concepts are being shared as the staff plays and talks through each possession. “We always tell them to talk, but seeing our staff do it with them, I think they’ve seen what high-level communication looks like,” DeCuire said. The other perk of summer workouts is being able to spend time tweaking each player’s skillset, without the pressure of winning a basketball game. It’s hard to make major adjustments during the year because change takes practice, repetition and confidence – things that are hard to implement in-season, but easier at this time of year. Much of the skills development has included one-on-one play and an emphasis on shooting. For some, the focus is more on reps. For example, a senior like Michael Oguine might need repetition opposed to drastically changing his game, while some younger players might need to implement something new or learn a system. A guy like Timmy Falls, coming off of a strong freshman season, is working on his mid-range jumper to add to his deep-threat repertoire. More than anything, though, summer is about implementing things so that when players are not under coach supervision during those four hours, they can improve on their own. The summer is broken up into two five-week sessions, and DeCuire requires his players to stay for at least one of them. Part of that is to get extra work in – training with teammates and in a structured setting – and part of that is to work toward their degrees and take a few summer courses. He also wants his team in Montana so they can enjoy all that the state has to offer – after all, it’s one of the great perks of living in Missoula, and part of the reason many of them signed on to play for the Griz. The 10-week summer session ended last week, allowing student-athletes to vacation and enjoy their hometowns for the next several weeks before school begins in late August. The team will next report together on Saturday, Aug. 25, two days before the fall semester begins. The following weeks will be a continuation of individual workouts before the Griz open official team practices in late September.